Reeta's Ruminations: To the Fairy Land and back! To the Fairy Land and back! Scribbly Skeets went to the Fairy Land on the weekend. She wanted to get lost there. And now she is back. Grinning from ear to ear just like the Cheshire Cat. She sprinkles some Fairy Dust on all of you. Keep smiling and be happy. so where were u ? and which fairy land would that be? Hey there stranger, welcome back!!.. durjoy dutta: It is a Fairy Land! Wow!! That road looks so perfect to pee on a cold winter day. Lovely shot!.wish it was something close by! fairyland sounds good...m sure u are rejuvinated!! What a beautiful winter morning (?). Those be poplar trees? 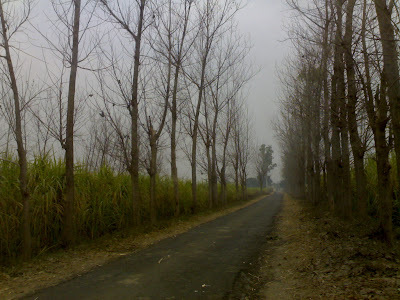 Narrow road...fields beyond...hmm rural... Punjab? No wonder you are grinning from ear to ear Ma'am... what a wonderful, wonderful place! I really need to get away from here now! PS: First time coming to your blog... hi! --Sunrise-- : Hey! Welcome here! thx :) Yeahh goooo get away! Went thru all the comments only to discover that Fairyland is at Fairyland. Lostweasely: cornish pixie :D Hu ha ha! lovely to have been here..